I’m in serious mourning here. Somehow, the fact that Howie Day was in Brisbane – or even Australia, for that matter – opening for Whitley completely flew under my radar, and I only found out after it was too late. To put this into perspective, Howie Day is one of my ultimate “hope and pray to see live” musos… and to this date I haven’t managed to accomplish that feat. My pain is only intensified by the fact that some work colleagues went to see Whitley, and then – get this – DID NOT EVEN BOTHER TO GO WATCH THE OPENING ACTS. Sigh. Can you say, “Philistines”? I can. Howie Day performing live. Sigh… for now I’ll need to content myself with a Live Music Friday. Anyway… I found it highly coincidental that I only found this out yesterday, while I was putting together a Live Music Friday post. And considering that Howie’s known for his live performances, I found it only fitting that I commiserate my misery by posting a Howie show. I have many live Howie Day shows. 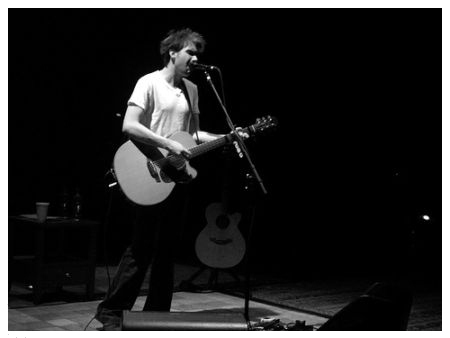 In fact, I can unequivocally say that Howie Day is the reason I got into tracking down rare live shows. Anyone who has seen the 30-minute DVD that was attached to his “Madrigals EP” release can attest to what a force he is live. Looping guitar lines and vocals through his trusty POD6, performing percussion on the body of his guitar and laying down some fat bass lines, Howie Day manages to string all the elements together in loops and build up to a full sound – all while performing solo – that far eclipses even that of a full band. It’s something that has to be seen to be believed, so I highly recommend that you get the Madrigals (Bonus DVD) set. It truly is the quintessential Howie. Here’s actually a taster, that I see someone has uploaded to Youtube. Best watch this fast, as I doubt they had permission to upload this from that DVD. Howie Day performing “Bunnies” live. In the last few years, Howie’s moved away from this solo looping and more towards performing with a full band. While it’s an understandable development, I know that many fans hope that one day he returns to his roots full-time. This performance is from 2001, at a Howie/John Mayer performance at the House of Blues. At times Howie sounds like a younger Mitch Hedberg; considering this was before his trip to rehab, however, this isn’t too surprising. The sound quality on this recording isn’t great; the lows bottom out, and it needs more treble. In addition to that, it includes perhaps the clumsiest outro on “Ghost” to “Beams of Light” that I’ve ever heard Howie perform. So after all this derision, why am I posting this show, of the many that I have of Howie? Because it finds Howie at his most passionate. It finds Howie at his most personal. It finds Howie at his most cathartic. Listen to “She Says”, and you’ll know what I mean. But the main reason? Because it has that song. That moment. The moment when Howie and John get up on stage together. Fans will know which one I’m talking about. Howie Day and John Mayer performing a killer version of “Sorry, So Sorry”. And while that track seemed to make it’s way around the internet a few years ago, the show in it’s entirety is a bit of a rarity. So I post it here for the true fans, who want to add it to their collection. I’ve also posted a remastered version of “Sorry, So Sorry” as a separate download, for those who need better sound quality (albeit only slightly). Oh. And if Howie, or his publicists come across this post, please know that I’m sorry for missing the gig. Now come back to Brisbane soon, ok? I’d pretty much resigned myself to never seeing him play live when I lived in South Africa, and now that I’m in a country that he actually visited and simply didn’t know about the gig… well, it’s killing me. So come back. Seriously. Previous Post Death Cab releases the much-anticipated “Narrow Stairs”. In related news, I was wrong. Wow, that’s impressive. Not many musicians can mix their own tracks let alone while playing them!